Does John McCain really want to win? The McCain campaign was embarrassed yesterday when Carly Fiorina, former chief executive officer of computer giant Hewlett-Packard — and a senior McCain adviser — questioned vice-presidential candidate Sarah Palin’s leadership credentials. Ms Fiorina tried to spin her comments in a later interview. If she really thinks none of them could run a company, why does she expect us to vote for any of them, especially with our economy in chaos? And here’s a note on Fiorina. She couldn’t run a major corporation either, which is why Hewlett-Packard dumped her. Doesn’t anyone remember that? 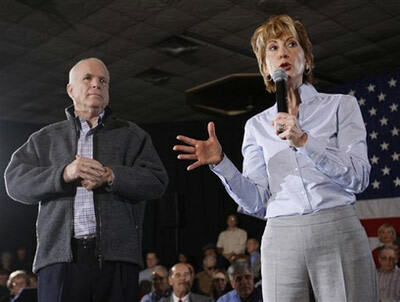 For a business perspective, Sen. McCain consults Republican National Committee Victory Chairwoman Carly Fiorina, the former chief executive of Hewlett-Packard Co., and Meg Whitman, the former head of eBay Inc. “He listens a lot,” economist Douglas Holtz-Eakin, Sen. McCain’s senior economic adviser, said. That’s bad news, since people in the know at H-P tell me that Fiorina was notorious for advocating illegal alien amnesty and for abusing H-1B visas for “skilled” foreign workers, so she wouldn’t have to pay Americans market wages for the same work. No matter who is President, the most important national security issue–our borders and who gets in and out of them–will not be resolved. Regardless of Palin, Thank G-d McCain didn’t pick Carly Fiorina as his Veep choice. Thank you for calling out Carly Fiorina. I’ve read her comments about McCain and Palin not being able to run corporations and I thought the same thing…”neither can you!” Maybe McCain is keeping Fiorina on to say “see? There are PLENTY of worse choices for VP.” I get the willies just typing the next sentence: The woman who ran H-P into the ground is the chairwoman of the RNC’s Victory Committee. YIKES! I agree with your assessment of Carly; BTW, you discussed strange womens’ first names a couple of weeks ago; Carly is certainly a strange one, and suggests the same kind of immaturity that some of the other do. A lot of the Republican elites are shafting Palin; regardless of her shortcomings she is certainly no worse than they are, and probably better. Murdoch hired hands are also attacking her more or less indirectly. I think they would rather see mcCain lose than have Palin a long-term threat to them. While I recognize her limitations, I still think she has the potential to become what the Republican elites would term ‘out of control’. They’d rather see obama win, and then they are still guaranteed control of the Republican apparatus. That’s one reason for the Republican soft-pedalling of Obama’s calling Palin a pig. A woman is sometimes not up to doing a man’s job. But in our politically incorrect world, that’s not what people want to hear about women – or minorities. The country is unfortunately, just that dumbed down. If it had a true choice, it would vote NOTA! Debbie, unfortunately the rumor here in California she is eying the Governorship here. She has many connections here and money. Unfortunatley is a typical California Republican. Not many Republicans that here to put on any list. The Republican party in California is in such disarray, true conservatives have no choice. Sorry the Reagan state has allowed 3 witches to run roughshod over Congress. Pelosi, Boxer, and Feinstein. Now a RINO to hold our Governorship, or maybe the Coverboy mayor from San Fran (Newsome) or Mayor La Raza from Los Angeles(Villaraigosa). Arnold was such a disaster. I wanted Tom McClintock for governor. He is running for Congress out here. 4th district. He looks like a winner. Great eloquent speaker and always come prepared for any debate. Will be a star in the House. If conservatives love Palin, they will love McClintock twice as much. Carly Fiorina was fired from Hewlett Packard for being incompetent and almost running the company into the ground with affirmative action policies. Talk to any of the employees that worked under her and they will tell you she was incompetent. In her previous job at Lucent, she was an affirmative action promotion that previously was a Kelly Girl before being promoted.She was part of the Lucent spinoff(scam) that was such a disaster for AT&T and was thrown out of there too before being picked up by HP. In short, this woman is not qualified to run any company because of her past performance and she should be embarrassed to give anyone advice based on her own resume. I hate to agree with Carly Fi-Fi on anything, but she is correct. I doubt any Pol could run a company of any size. That includes my rep Darrel “I Love Syria” Issa; who allegedly built a company. Then again, Carly sucked at it also. I was always taught that “A” people surrounded themselves with “A” people and the “B” surrounded themselves with “B” and “C” people. Seems Johnny McAmnesty is an “F” person. The problem is, we are falling into a trap if we accept Carly’s frame of reference. Just because she posed the question of whether Palin can run a company does not mean we have to consider the question relevant. Palin probably cannot play the trombone either. I’m saying that even discussing this question implicitly accepts the premise that this is a relevant point to discuss. If Carly had asked whether Palin can be a good vice-president, or whether her political positions are good or bad, that’s one thing. But discussing the plusses or minuses of Palin’s ability to run a company is kind of irrelevant (although she obviously has a lot of respect for entrepreneurs, which is more important, I think) — although 8 years ago, no one would have said she could be an effective governor, so you just never know. Sarah Palin was able to win a lawsuit brought by Rockefeller controlled BP to allow bidding on a Natural Gas Pipeline that had been sitting on the BP drawing boards for over 30 years. That project was valued at over 40 billion dollars and will produce over 500 million in taxes for the state of Alaska. Seems to me she can run a company with the best of the them. As for John McCain, I would not trust him to sweep the streets.As a Californian, I will never forgive the Keating Five scandal that cost us taxpayers and retirees 80 billion in losses. McCain’s best friend in the Senate is Lindsey Graham, give me a break. He also loves Ted Kennedy and Russ Feingold. They spend all their time viciously ridiculing everything I believe in. You people knock yourselves out supporting the traitor-Republican party. btw, they all let their masters on Wall Street defraud the entire United States and our economy with their fraudulent, fake debt they chopped up and resold as triple A. You are paying for that, in devalued dollars, devalued stocks, lost investment in our economy, lost opportunity, lost dividends…yeah, go ahead and vote Republican. That’s why they invented hedge funds, SIV’s, derivatives, asset backed securities, and all their other lies, in the first place, to steal and avoid the rules we had in place. And good ole John McCain and his party are right in there with the Democrats letting their buddies rob us blind. As an employee of HP, let me say, Carly proved she ain’t fit to run a major corporation. Her opinion is worthless. She was paid lots of money to go away – she ought to keep her pie-hole shut. What’s with the mannish outfit she’s wearing in the pic? Looks like she should be called Carl instead. Granted she’s an idiot, but she’s doing what idiots do,running her mouth. The problem is why is McCain taking her advice? The one and only reason I’ll vote for McCain is I am truly concerned Obama will definitely ruin the country. I don’t at all like McCain, but if we think it’s bad now, I think Obama would ruin us once and for all. As CEO, Fiorinna once praised Islam for some major innovations that it did during the middle ages – innovations that an Assyrian correspondent pointed out to her was plagiarized from the Assyrian Christians of the area at the time. I think this was just an unfortunate slip of the tongue. I am sure she believes it but she should not have made the statement. As far as I am concerned we have had very few Presidents who were qualified to run major corporations, their senior advisers would have to be dumb not to know this, but they managed to bite their tongue. As for Carly’s time at HP, I believe she got a bad rap. I had a 10 minute personal one on one conversation with her at HP World (HP’s user group conference) right after she took over. She impressed me. Carly was hired by HP to make HP the internet business leader right before the internet bubble burst. I have no doubt she would have succeeded had the bubble not burst. I have some basis for saying this as I would dealt with both HP and their competitors as part of my job. As for the Compaq acquisition, I also think she got a raw deal there but I did not know much about it. I discovered the other night that she did sell computers to Iran, and for that she must be condemned.